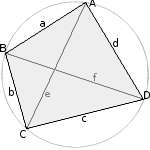 Calculations at a cyclic quadrilateral. 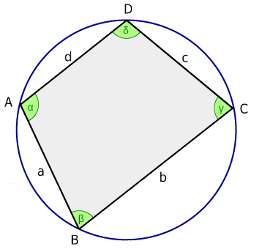 A cyclic quadrilateral is a quadrangle whose vertices lie on a circle, the sides are chords of the circle. 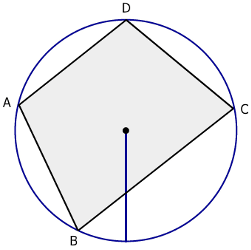 Enter the four sides (chords) a, b, c and d, choose the number of decimal places and click Calculate. Angles are calculated and displayed in degrees, here you can convert angle units. 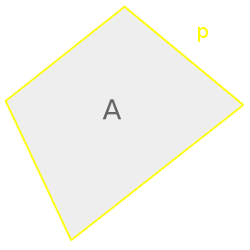 Side lengths, diagonals, perimeter and radius have the same unit (e.g. meter), the area has this unit squared (e.g. square meter). 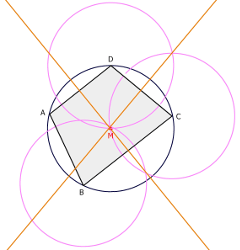 The center of the circle is at the intersection of two perpendicular bisectors. 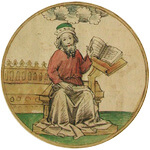 These can be constructed by drawing intersecting circles around two neighboring vertices and connecting their intersections.